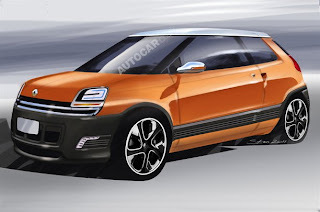 Just A Car Geek: A New Le Car (R5)? A New Le Car (R5)? This is not the type of post I usually do, but this is too cool not to share. According to Britain's Autocar magazine, Renault is considering reviving the R5. (Also known known as the Le Car here in the US.) The original R5 is a car that I, and many JaCG readers, still admire and desire. Click here to see the Autocar article. A big thanks to JaCG reader, Simon, for sending me this! After suffering the endless reliability issues from my new 2003 MINI Cooper, Renault can do no wrong and I totally hope this could come to the US. I'd still continue my daily countrywide hunt for a great, original Le Car but this would be a blast. Hope they don't re-invent it too much.